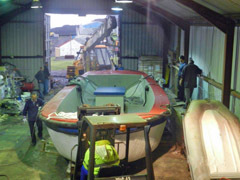 News of the boats based onshore at Calshot Harbour that service visiting vessels, and also provide transport around the main group of islands. 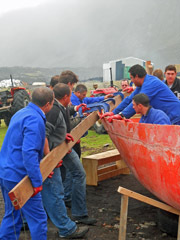 to service visiting vessels, and also around Tristan da Cunha, Nightingale and Inaccessible Islands. so school children were entered a competition to choose one. Callum Green won the competition with his choice of 'Arctic Tern'. 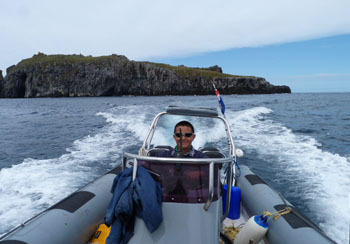 to Nightingale Island on the RIB. 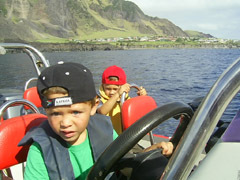 It was Callum's first visit to Nightingale Island as, like many of the younger generation he had never been to Nightingale. carry out surveys on 19th September 2014. 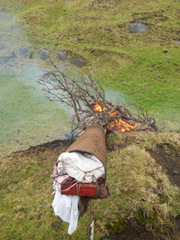 Top Left: The fire heating the pipe to make the water inside hot ~ this will warm the wood inside to make it pliable. 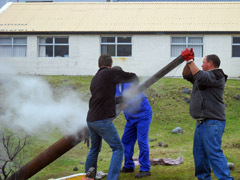 Top Right: Once hot the boiling water comes out of the pipe, the wood is ready. 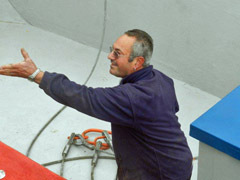 Above and below: Using gloves and moving quickly the wood is removed and placed onto the side of the fibreglass boat, bending it to fit the shape and clamping it whilst still hot. 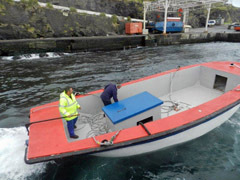 Joe Green has been in charge of Tristan's PWD's Mechanical and Gas section for many years and his last big project was the refurbishment of the island barge 'Atlantic Wave'. 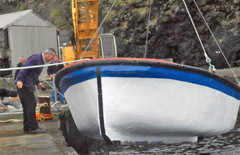 Joe has been regarded as Tristan's 'Mr Fix-It' for many years and the local expert on a range of vehicles ranging from Land-Rovers to all the island's inshore vessels. These images show the 'Atlantic Wave' being taken from a PWD shed to Calshot Harbour for its test run on 31st May 2012 ready for the arrival of MV Edinburgh in early June. Joseph is 65 on 8th June and this was his last day of work before retiring from Government service, but is unlikely not to be under a bonnet for long! Lost at sea! The bottle slips out of Joe's hand! 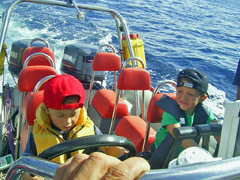 Tina Glass has sent these brilliant pictures showing her son Tristan Glass (in the black cap) with friend Rhyan Swain (red cap) apparently at the helm of one of the new RIBS brought to the island during the MS Oliva crisis in April 2011. 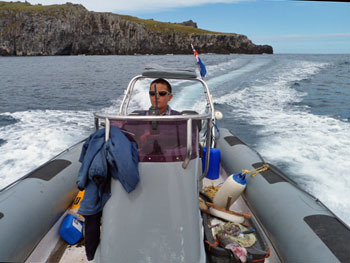 Photograph by David Morley of the Atlantic Dawn en route to Nightingale Island in an attempt to move Peter Ryan and his team to Inaccessible Island. On arrival the swell was too high to allow landings and the group came back empty handed. The crew are left to right: Rodney Green, Leon Glass, Warren Glass, Conrad Glass (cox) and Neil Swain. On Wednesday 13th June a party of 23 men set out in a barge from Calshot harbour to kill some of the wild cattle herd at Stony Beach for beef. Earlier the same morning a separate group left for Sandy Point, and as they were killing cattle saw the Stony Beach party heading south. The Sandy Point party returned to the harbour by noon by which time it was raining. 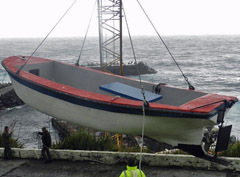 Andy Repetto (Tristan Radio operator) had earlier warned both vessels of deteriorating weather, but no-one predicted how rapidly it would worsen and by 14.30 the harbour became impossible to navigate. 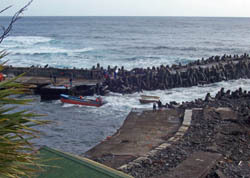 The Stony Beach party completed their hunting (cattle are killed using rifles) and headed home in worsening weather conditions, with a north-north-east wind strengthening during the day. As they reached Jews Point it became obvious that they wouldn't make it back to the Settlement, and certainly not land in the harbour, so they returned to Stony Beach. 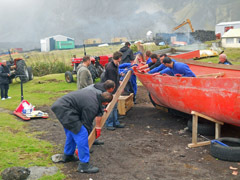 Normally dinghies are used to transport men and stock / meat to and from the barge, but on this occasion the barge was beached and the dinghies pulled up the beach above the water line. The party spent an uncomfortable night in the huts, using a makeshift collection of dry clothes but managing to cook ample hot food and drinks. 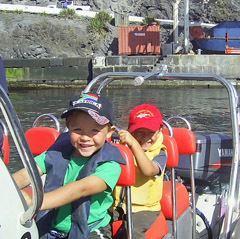 Their VHF radio was limited to eye contact range and so could not communicate with Tristan or the factory radio, so their families had no knowledge of the party's whereabouts or safety overnight. All in the village were very worried overnight for the safety of the party. 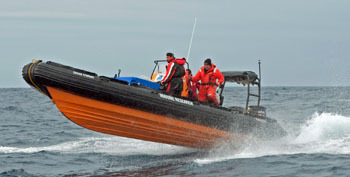 The next morning, Thursday 14th June, Chief Islander, Acting Administrator and Police Inspector Conrad Glass led a rescue attempt, setting off on the police rescue RIB Atlantic Dawn, with Joe Green at the helm of Wave Dancer. 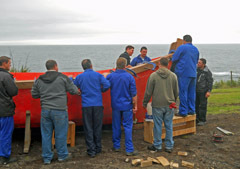 The start was delayed to wait for a higher state of tide to enable them to set out of the shallow harbour safely in the swelly conditions. Atlantic Dawn reached Stony Beach by 08.30 am, with Wave Dancer arriving 20 minutes later. The party was found safe and well. 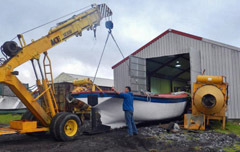 The stranded men were loaded on the boats and the damaged barge (now covered in diesel) was towed off the beach. Progress back to the harbour was slow, as the damaged barge, known as The Sandy Point Express, stopped twice owing to fuel problems. 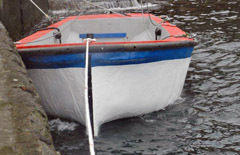 The flotilla was met outside the harbour by the factory barge, onto which meat was unloaded and by which two of the dinghies were towed home. 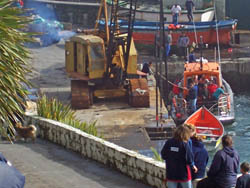 A final drama occurred when the Sandy Point Express again foundered at the entrance to the harbour as the swell got worse. 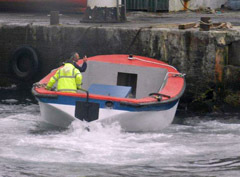 Luckily the vessel was near enough for a painter to be thrown to Lewis Glass so the boat could be assisted into the harbour and not left vulnerable to surf which could have easily engulfed her. Conrad reports that Ken Green and Roger Glass (two of the most experience coxswains in the Stony Beach gang) said that Wednesday's weather was the worse they had experienced in a boat during their lifetime. Photographs taken by Desiree Repetto on 14th June from above Calshot Harbour as relieved islanders saw the convoy returning the boats and men home. Trevor Glass, Warren Glass, Jeremy Green, Jason Green. 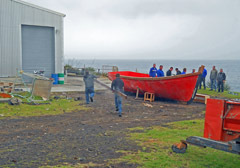 On 23rd May the launch Atlantic Spray, Police Rescue RIB Atlantic Dawn and Fisheries Patrol boat Wave Dancer brought both parties back. 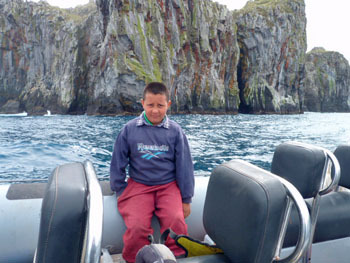 Good weather, with a WSW wind of about 10 knots, meant several private boats were out fishing for white fin fish. 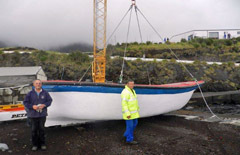 Andy Repetto was in constant contact with all boats via Tristan Radio, and the boats from Nightingale all arrived safely back at the harbour at 16.15hrs.